The first woman has been appointed to lead the Corps of Cadets. Alyssa Marie Michalke arrived at Texas A&M University in the fall of 2012, shy and quiet, she says. Now she's set to lead one of the university’s most storied campus organizations. 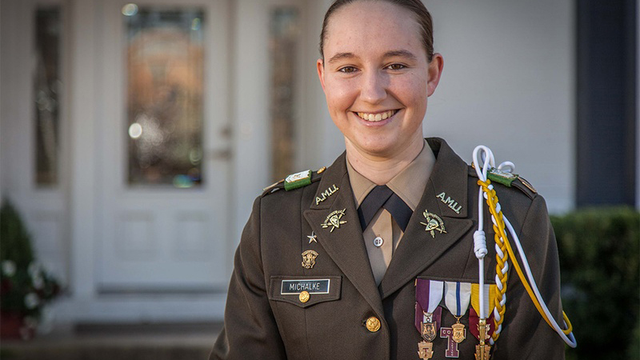 Texas A&M’s Corps of Cadets announced last week that Michalke, 20, had been selected as its next commander — the first woman to assume the role in A&M’s 139-year history. Michalke will begin leading the corps, a student military organization, in May. Often called the “Keepers of the Spirit,” the corps is deeply woven into campus history and lore. Former Texas Gov. Rick Perry was a cadet. The corps first allowed women to join in 1974, and more than 300 are now among the roughly 2,400 members. Michalke, who comes from a family of Aggies, joined the corps her freshman year, and brought with her an impressive list of accomplishments from high school including participation in multiple sports, the National Honor Society and yearbook, along with holding a part-time job. “I like being challenged, as far as time management, and just pushing myself to the limit on a daily basis,” Michalke said. Since the announcement, Michalke said she has received congratulations from A&M alumni, former cadets and university regents. "I’m certain our next president will look to her for advice and counsel in the same manner I relied on [the current commander]," said Texas A&M Interim President Mark Hussey, who exercised final approval of Michalke's selection. Michalke said she joined the corps because she wanted leadership experience before graduating and pursuing a career in offshore oil production. “It takes a hard work ethic, a lot of time and effort to do well in the corps. We’re students, but we’re also cadets,” Michalke said. Michalke said that while she was shy when she was a freshman, she is glad she got out of her comfort zone.